watch for twice as long, while showing more ads than before. · 1-hour average visit (doubled). · 85% more page views. · 95% 5-star app ratings. · 128% more ads viewed. · 720% more sponsor visibility. · Samsung Smart TV app. Joel Marsh, an art director, 2 UI designers, 4 internal developers, 3 external developers, the client’s internal sales and content teams, and one very busy project manager. Research, strategy, and UX design. One of the advertising concepts presented during this project included a page so long that the site footer was upside-down and written in Chinese. The temptation to copy competitors is an overwhelming urge for product teams, even for industry leaders, but the fear of changing what made you successful can be even stronger. In this case, we had to resist both. Kanal 5 (owned by Discovery Networks) had always been a leader in offering online digital content. However, when competitors started to catch up to their on-demand strategy, it was difficult to see how they would continue to dominate the online cable market. These were the days before Netflix was everywhere, before YouTube had “channels” and continuous viewing, and before Facebook let you watch and browse at the same time. When Kanal 5 brought us in to formulate a strategy, the first thing we did was re-define their perception of competition, and then we did something nobody expected: we made their website and apps more like offline television — and it increased every key metric by 85-720%. This project was also a rare opportunity to A/B test an entire website against an entire website. Since we re-designed the whole thing, and there were a few nerves about such a radical update, we split ALL of the traffic between the old and new site to confirm that the new site performed better. We also tried putting the new site into the main menu of the old site as a “beta”, so users could choose to use the site they preferred. In all scenarios, the new site overwhelmingly out-performed the old site in all available metrics. Competition ruined the business model that worked in the past. When Kanal 5 originally launched their on-demand service, users were willing to tolerate more, because online television wasn’t as common. But when competitors started doing the same thing, it became hard to get people to register and pay. For everyone. As always, we began by researching what users really wanted and really did. Interestingly, our conclusion was that Kanal 5’s main competition wasn’t the main competition. It was illegal downloading. Kanal 5 was actually being compared with BitTorrent/PirateBay. Free, high-quality, ad-free episodes of anything you liked, whenever you wanted them, as long as you were willing to wait for them to download (and risk getting caught). Every television site wanted users to register and pay for a limited selection of episodes, which still might include ads, at a lower video quality. For one user to watch everything they liked, on every channel, it could cost a fortune. Or they could just download it. So we suggested something that seemed crazy at the time: users would be willing to tolerate ads as long as the service was more convenient than illegal downloading. Videos had to start instantly, be high-quality, and most importantly, the service had to be available for free by default, without a registration. Wait, a cable channel, for free? It required some discussion. We also suggested that they offer as many old episodes as possible, rather than just the newest season, as they had been doing. When people binge-watched illegally, they often tried to catch up on a whole season, and Kanal 5’s data confirmed that “episode 1” of every program stayed popular even as more episodes were added. Netflix would later make “binge-watching” part of their core content strategy by releasing whole seasons at once. 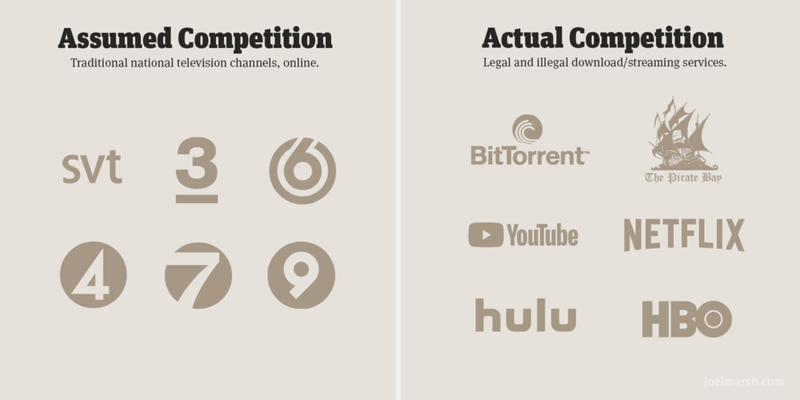 There were a few limitations due to licensing rules, but the decision was clear: benchmarking against illegal downloading instead of traditional competitors created a different set of expectations, a different business model, and a different kind of service. also the main engagement killer. To achieve our better-than-downloading goal, we needed our content to be high-quality, free, without downloading or registering (although premium upgrades were also available). Therefore we needed ads for revenue, but on the internet, ads usually decrease engagement. During our research we discovered that a typical offline television experience lasted for hours — and included more ads — but a typical online experience only lasted for one episode. More content and more ads?! Clearly offline television was a superior format. But why? As much as people like to have control over their experience, control requires active choices. Offline television is passive; just sit down and turn your brain off. We wanted the best of both worlds. We designed a video website that was always on, always playing, always free, and which would keep playing until the end of time, if you were willing to watch that long. Our behavioral data showed that 70% of users logged on to watch the episode they just missed offline, so we put the online channel on the same timetable as offline, but “off by one”. It was very effective. We allowed people to pause an episode on the website and keep watching in the apps, and the site could also learn what you liked, which were the first two user-oriented reasons for people to register. Conversion doubled within the beta test period, even though the service was free. 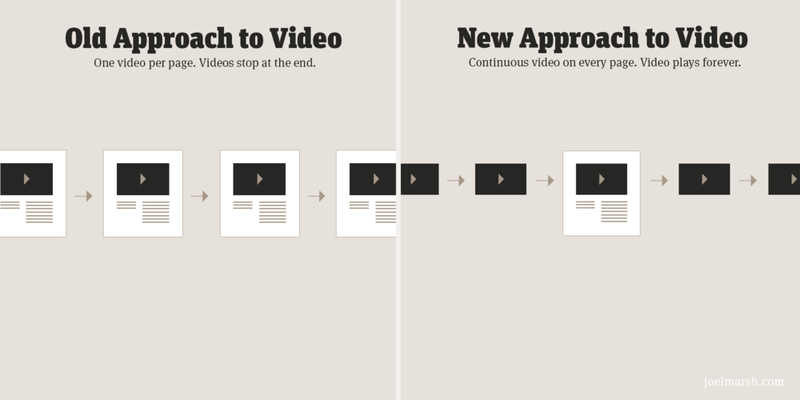 The video player also followed users down the page, and kept playing if you navigated to another page or used the back button, so you could browse for programs or read blogs without interrupting the viewing experience. Overall, it was a different kind of television site, and the results spoke for themselves: more revenue and more engagement.